Storytelling is a universal and traditional art form that has featured strongly in Indian culture as an effective communication tool. It can be used to inform, entertain and educate. It is often used as a medium to ingrain values, improving reading skills and opening the minds of children to worlds beyond imagination. 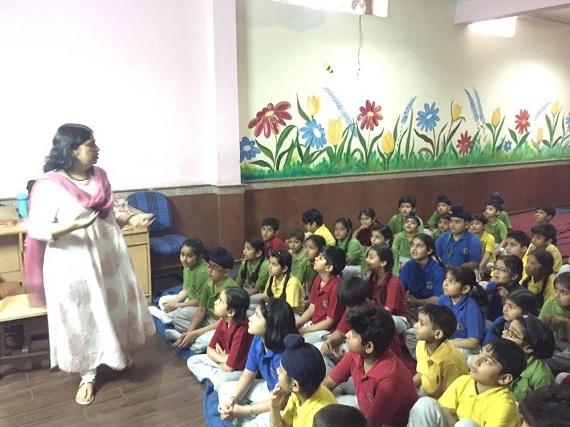 A workshop for story-telling was thus organized for class 3, by KRM by Ms. Vandana Tondon, on 8th April 2016. The session was indeed valuable and distinct. Children found it really interested and engrossed in the story of “The king with big ears” which was told to them with creative gestures and facial expressions. The appropriate use of voice modulation and body language infused passion, enhanced imagination and expression and introduced children to new horizons of storytelling. It was an interactive session where children were taught the right way of telling the stories. Overall this session helped the young souls for creative thinking.